What are the cornerstones of a traditional Italian cuisine? Pizza, pasta and POLENTA! Yes, while pizza and pasta would have probably come to everyone’s mind, Polenta does not get the recognition it deserves. Humble, yet satisfying the Venetian dish has probably more ancient history than the latter. Characterized as peasant food, it has been around in the Venetian region for centuries. But, how do you make it? And, what do you have with it? Well, let’s discover the inns and outs of this Venetian dish. Pour milk in a heavy-based pan and add the water and salt. Bring to boil. When milk-mix comes to boil, add the cornmeal to it. Make sure it runs through your fingers in thin streams when adding it. Whisk continuously. Turn the heat down. Stir every 4-5 minutes to prevent it sticking to the pan. Repeat this for 35-45 minutes until mixture thickens and all moisture is absorbed. When Polenta comes off the sides of the pan, add butter and cheese. Stir again. Put the Polenta on a dish. Did you know? Even though Polenta has a reputation for being rather plain, the Venetian dish can be cooked in various ways. 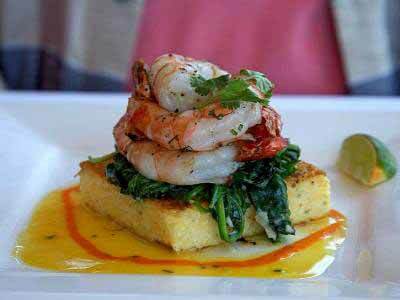 So, why not add prawns to your Polenta and make it a “Scampetti con polenta”? Or, grill it and serve it with porcini mushrooms or truffles – a true autumn highlight! Can’t get enough of the Venetian cuisine? Then come to one of our cooking holidays in Venice! We at Flavours will teach you how to create authentic and delicious dishes from the region while you’ll be able to completely immerse in the beautiful culture and landscape. For more information contact one of our friendly staff members. To see this year’s availability click here.